First, can I get a little applause for my success in getting a building permit for our renovation? I was so nervous, but it was really no big deal and it only took about 20 minutes of palm wringing and nervous leg shaking (as I wondered if they’d kick me out of the office because I’m not a “professional” contractor.) Plus, I was also able to interview the director of Building and Planning of Wake County and asked him a ton of questions about permits. I’ll be sharing his answers to my inquiries soon. First I built a hutch from an old table top. 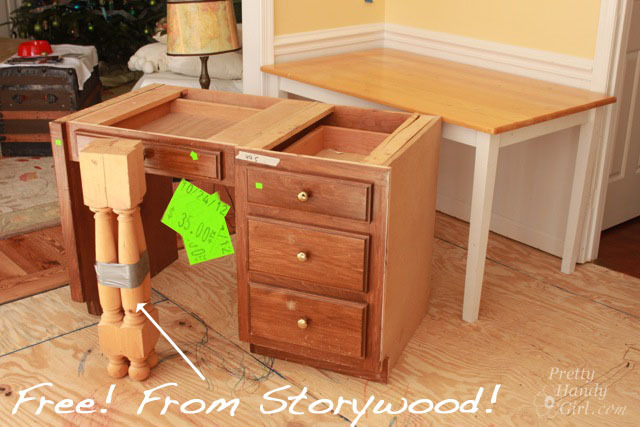 And I gave this ReStore desk a Frankenstein style revamp with free table legs (thanks to my good friend Holly of Storywood Designs) and a free kitchen table! Check that little green sticker there…$35 bucks baby! The drawers are in excellent condition and have ball bearing slides. Good bones I tell you, good bones. Can you believe that’s the same desk? This is going to be our family command center where I can keep track of all the school papers and forms that need signing. I think a family calendar might look swell on the wall under the hutch — Don’t you think? The electrician will be wiring a sconce into the lower center cubby so I can flip it on for extra light. I also framed out the window seat and moved a floor vent to the front of the seat. The electrician has to wire an outlet into the front of the seat to meet code requirements (that there be at least one wall outlet within 12′ of wall space.) No big deal, I just don’t want to fail our inspection. Before you ask, yes, a tutorial for building a window seat will be forthcoming. Our good friend Bob came over with his BIG drill and a hole saw to show me how to move the plumbing vent stack back into the wall. You gotta love having good friends with good tools! Pretty Handy Boy #2 has been keeping busy working on his own projects. This is supposed to be a house for his stuffed animals, but right now I think it is just a condo. Hopefully he won’t need a building permit when it comes time to add on to that dwelling. The wall where the fridge and new cabinets will go got a few new holes today. Sheetrock and insulation also came down on the opposite walls so the electrician could work more efficiently. The sheetrock was damaged anyway and was slated to be replaced, so this wasn’t too big a deal. That would be two walls studs that doubled as an “All You Can Eat” buffet for a family of termites. Luckily the damage was limited to the two studs and base of the wall. We should be able to replace the toothpick lumber tomorrow. On Facebook and Instagram I asked which cabinet color scheme you liked better. It was a 50/50 split, but you helped me decide that white upper cabinets would really make my heart thump louder.